The best yellow bus destinations in the Windy City. 1. Are you brave enough to peer over the ledge? On the Skydeck of the Willis Tower, brave students (and teachers!) can walk on a four-foot-wide glass-bottom balcony—103 stories high! Dubbed The Ledge, this is sure to thrill students of all ages! For students who may not love heights so much, there are plenty of other exhibits in the Skydeck, including games such as I Spy on High and scavenger hunts. 2. From farm to factory: How is ice cream made? Oberweis is a popular dairy and ice cream shop in the Midwest, so most of your students have probably already tasted this deliciousness, but how many kids get to brag that they saw how their favorite ice cream is made! Visit the Oberweis factory at 951 Ice Cream Dr., Sweet One, North Aurora (cute, right?) and let your students see the behind-the-scenes workings of a real factory. 3. Travel back to the time of King Arthur. A beautiful princess, daring jousting matches, and a feast fit for a king? Yes, please! A trip to Medieval Times is exciting for any student; there is a little something for everyone! When you book a field trip with a matinee show, your class will get even more: an educational presentation after your 90-minute show and a four-course luncheon. What a fun way to bring history to life! 4. Learn and play at the Chicago Children’s Museum. Children’s museums are a popular field trip destination, and there are few better than the Chicago Children’s Museum. Students will love the hands-on nature of this museum, particularly the chance to dig for dino bones! Another favorite: the opportunity to explore a three-story boat—without any of the seasickness! If you’re planning a day at Navy Pier, this must be a stop on your adventure. 5. Watch the Bard come alive at the Chicago Shakespeare Theater. If you’re an English teacher and plan to teach Shakespeare this year, be sure to plan a trip to the Chicago Shakespeare Theater. We know that Shakespeare isn’t always easy for students to understand, but seeing one of the Bard’s plays come to life allows students to experience a play as it was intended—live. 6. Take an architecture boat tour. Part of what makes Chicago such a wonderful city is the unique tapestry of architecture. 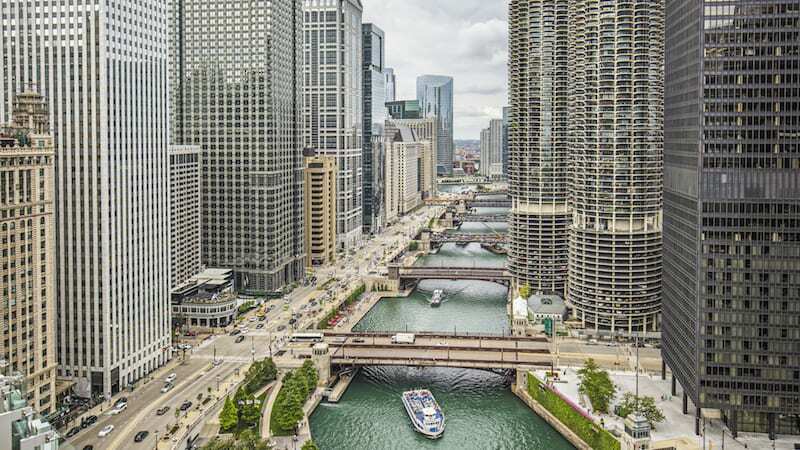 Chicago Architecture Foundation river tours explore the city’s architecture from the vantage point of the river. Because this excursion boards from the River Walk, it allows you to explore the sights and sounds of the recently renovated walkway—complete with a gelato stand. This would be ideal for older students. 7. Go wild at the zoo. When it comes to zoos in Chicago, you’ve got choices. There is the Lincoln Park Zoo, but if you’re planning a field trip, opt for Brookfield Zoo. This zoo offers awesome experiences that will thrill your students. Tropic World allows you to walk through the monkey exhibit, while the Bird Encounter allows students to hand-feed parakeets. 8. Reach for the stars at Adler Planetarium. Studying the planets in science class? Take a trip to Adler Planetarium. From exhibits suitable for preschoolers (a giant space-themed play place) to exhibits and movies suitable for high schoolers, this destination has something for all learners. 9. Discover farm life at Fair Oaks. 10. Time travel to the Jurassic period. Do your students love dinos? Take a visit to the Field Museum where your students can see a variety of dinosaur skeletons, including the world famous Sue! The museum experts can even create a tour customized to the age of your students. Chicago and Illinois residents are free, but even an out-of-state ticket is reasonable at $17.75 per person. 11. There’s nothing fishy about the Learning Labs. A visit to the Shedd Aquarium is more than just watching fish swim in giant aquariums. A visit to the Shedd is as hands on as an aquarium can be! From touching the sting rays (a seasonal offering) to petting a real-life starfish, students can interact with several types of marine life. There is also a play area for young students (across from the penguins) and several learning labs for high school students. 12. Extract your own DNA at the DNA Learning Lab. The University of Notre Dame offers some seriously cool field trips. In the DNA lab, students can extract their own DNA or learn about forensics by solving a pretend crime (a kidnapped leprechaun, to be precise!). Although this field trip is in South Bend, Indiana, it is a feasible day-long field trip for any school in the greater Chicago area. Ideal for high school biology classes. 13. Become an Iron Chef. What’s more fun than getting your hands dirty in the kitchen? Learning the science behind what makes your favorite recipes so yummy! With multiple menu options available, your students will love this cooking lesson at The Chopping Block. 14. Take flight at iFly. Who doesn’t dream of flying? At iFly, you can! This STEM-enriched program first teaches students about the physics of skydiving. Students then undergo “flight training” before they get to experience their own skydive in a giant wind tunnel. BRB as I go get ready. 15. Let the field trip come to you. The Peggy Notebaert Nature Museum boasts something unusual: They can bring the field trip to you! When you book a classroom-based field trip, curators from the museum bring science-based, hands-on activities to your students. All of the fun without any of the travel! 16. Design your own house with the Frank Lloyd Wright Trust. Venture to nearby Oak Park to visit the Frank Lloyd Wright Trust. Students will not only learn about the vision and design behind the Wright house but they will get the chance to doing a little designing of their own. The Trust even offers lessons plans so you can prep your students before the field trip. If you can’t make it to Oak Park, you can rent equipment and host a design workshop in your own classroom! 17. Channel your inner Bill Nye at the Museum of Science and Industry. The Museum of Science and Industry, located in Hyde Park, is a tried-and-true field trip destination. Where else can you venture deep into the heart of a coal mine, explore the depths of the ocean on a U-505 submarine, or learn about genes through the world’s cutest farm animal (baby chicks)? 18. Learn about art through making art. The National Museum of Mexican Art offers hands-on learning! The work of art your students make will be influenced by upcoming Mexican holidays, so your students will learn a lesson in both art and history. Grab your painting smock and head over to Pilsen. 19. See history from a beautiful perspective. Interested in a trip to the DuSable Museum of African American History but not sure where to start? As a Smithsonian affiliate, the DuSable has you covered. Grab your lessons plans and guide your students through the amazing history of African Americans, from the brave heroines of the Civil War to the number-crunching African Americans who changed the world of mathematics. Did we mention there’s also a “mobile museum” that can bring the history to your school? 20. Make a stand for peace at the Hull House Museum. Did you know the Hull House was once Jane Addams’ home? It was also a safe haven for immigrants, a nursery school, a hub for the Women’s Peace Party, and a school for ESL and cooking. Visit the Hull House Museum and see first hand how Jane Addams’ work led to her Nobel Peace Prize. 21. Write your own story at The American Writers Museum. A trip to The American Writers Museum is part museum (see and touch real typewriters), part writing lab, and part write0in. This is great for English teachers who want to help foster of love of writing in their students! What Chicago field trip ideas did we miss? Come share in our WeAreTeachers HELPLINE group on Facebook. Plus, check out the best Houston field trip ideas.